He runs impulsively and courageously, carrying his country’s flag as if he were carrying his own dream. He looks young, athletic, and fearless. He jumps over a bridge’s fence and runs to the place where many of his countrymen were killed not long ago. Then he raises his flag and waves it high, trying to avoid the policemen running to stop him. He was standing in that same spot six months ago, carrying that same flag and living that same dream. Today, his dream is besieged, just like the spot where he is standing. Soon, dozens of riot police rush out from four vehicles, surround him, take him down, and confiscate his flag. There, his punishment awaits him—a brutal beating by the police, who then take him away. His name is Mohamed Ali Alhaiki, an ordinary young man who was the talk of Bahrain few days ago. 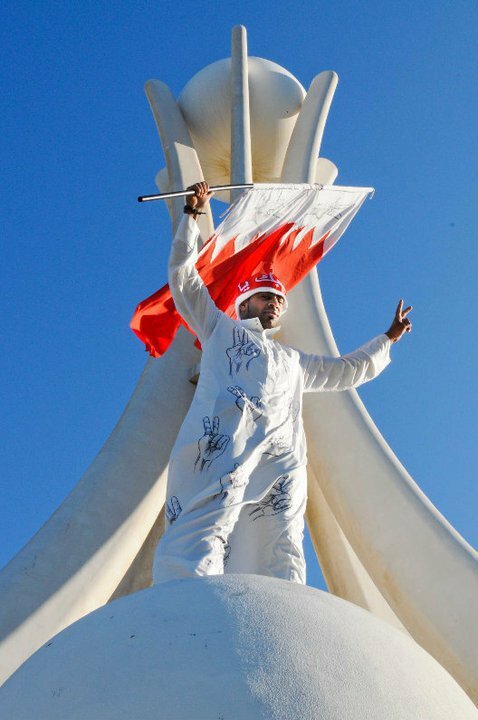 On Saturday, Mohamed—who was fired from his job after participating in the anti-government protests—decided to carry the Bahraini flag and walk with it right to the middle of Pearl Roundabout in the center of the capital Manama. Mohamed’s symbolic action, which was filmed and posted on YouTube, will be remembered by hundreds of thousands of Bahrainis who have participated in pro-democracy protests since February 14th. They will remember this like they remember Ali Jawad Al-Sheikh, the 14-year-old boy who was killed a few days earlier on the morning of Eid—one of two days of celebration for Muslims—while he was participating with his friends in pro-democracy protest in his village. Although protests have continued on the streets of Bahrain every day since the Saudi-led crackdown on Pearl Roundabout last March, there has been very little coverage of the Bahraini movement in the international media. There are several reasons for this. First, six months after the movement started, it’s clear to Bahraini activists that the United States is not in favor of any changes. The US wants to protect its interests in Bahrain—most importantly, securing the Navy’s Fifth Fleet—and avoid any direct confrontation with Saudi Arabia, which is calling the shots in Bahrain right now. The US’s posture has played a major role in marginalizing Bahrain in the eyes of the international media. Second, the Bahraini government has successfully killed the movement’s presence internationally. It has used several tactics to achieve this, including a ban preventing international media from entering the country and ensuring that many local journalists are jailed, tortured, or fired from their jobs. Moreover, the establishment of a truth commission by Bahrain’s King Hamad bin Isa Al Khalifa, together with the government’s call for a national dialogue, created an illusion that things are quiet now in Bahrain and that it’s just a matter of time until everything will be fixed. However, observers of the country know that the national dialogue was a failure, and that the truth commission has no authority to change anything on the ground. Lastly, events in the rest of the Middle East have overshadowed the struggle on this tiny island, which has a population of around one million. For the mainstream media, the 34 people killed in this struggle, including four who died in jail after being tortured, are not as significant as the thousands being killed in Syria and Libya, regardless of the fact that this is a very large number for such a small country. There have been several attempts by the international media to bring the case of the Bahraini people alive again, especially through a series of recent documentaries on Al Jazeera English. Last month it aired “Shouting in the Dark,” which beautifully captured the essence of the Bahraini movement and got a lot of attention after it sparked clashes between the governments of Bahrain and neighboring Qatar, which owns Al Jazeera. Today, seven months after it all started in Bahrain, the movement is still alive and active, as well as more organized. Even when the international media is not watching, people like Mohamed Ali Alhaiki are breaking through fences to raise their own flag. They know, after all, that it’s not just a flag; it’s a dream which they are determined to turn into reality. Thank you, Nada, this is an extraordinary story. It’s a reminder, I think, that media generally won’t pay attention to resistance movements unless they somehow feel it’s in their interest to do so. Part of the job of resisters, therefore, is to ensure that it is, by whatever means. Those of us journalists who do take it upon ourselves to cover resistance movements should think about what got us here, and how we can get our colleagues to follow. What an amazing picture, too. I want a suit like that. Nada, beautiful article. Nobody can forget Moh’d from the days of the roundabout with his beautiful dress/”thoob”. Although the roundabout has been demolished, yet the memories live within us, and more importantly the feeling… the feeling of being… is indescribable. Thank you Alwadi, for summarizing the situation in Bahrain intelligently with the same value of AlHayki work. I’ve been following the Bahrain situation for many months. Actually, it is not completely true that international media are not reporting; BBC reports, and I have seen multiple news reports from Australia, Amnesty International, UK, Ireland (remember the Irish Delegation?) Russia, China, Canada. Obviously with a ban on journalists this is a difficult situation but the information is most definitely ‘out there.’ Social sites play their part, with Facebook and YouTube hosting hundreds of videos and photos. Yesterday was an extraordinary day of celebration with the release of the Drs. Even though the charges against them were not dropped, they are free and with their families for now. Great awesome issues here. I’m very glad to look your post. Thank you a lot and i am looking ahead to touch you. Will you kindly drop me a mail?